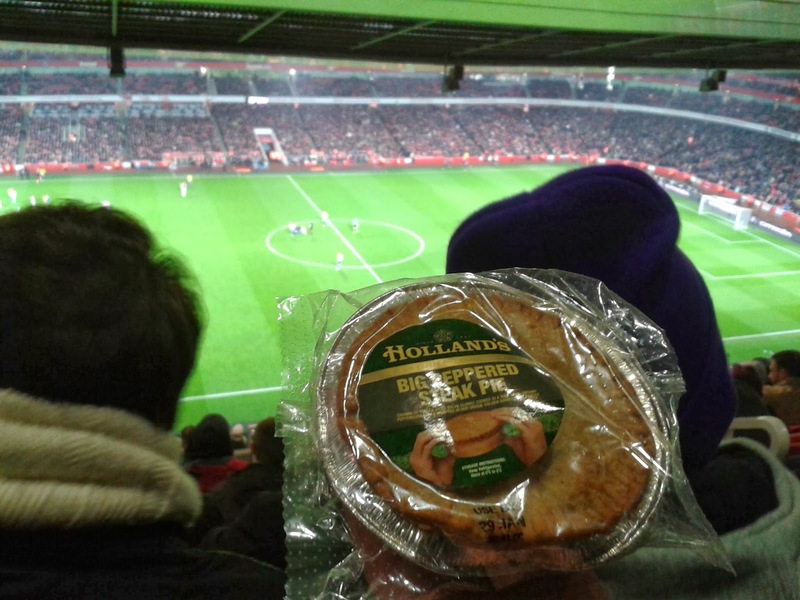 Pierate - Pie Reviews: How am I Gunner score the Holland’s Peppered Steak Pie? How am I Gunner score the Holland’s Peppered Steak Pie? 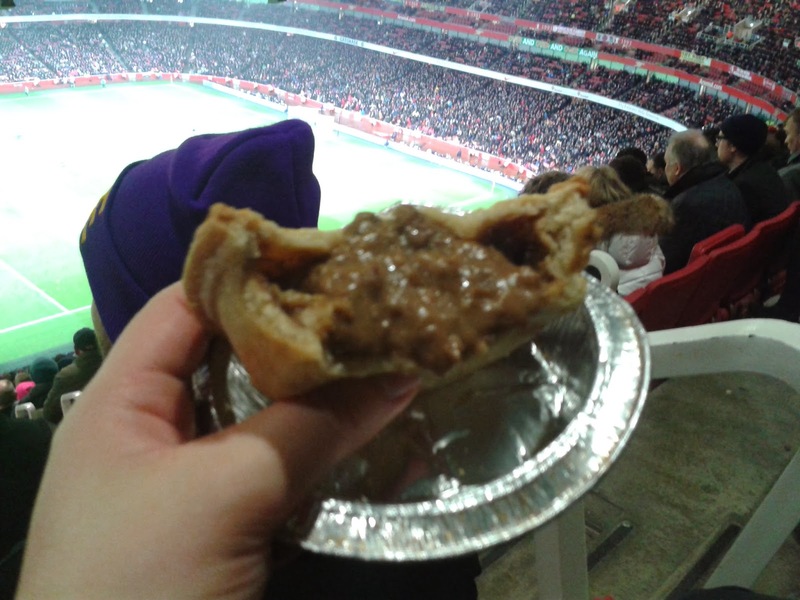 With a ticket to watch Arsenal v Coventry in the FA Cup at the Emirates Stadium, there was no doubt that I was Gunner try a pie at half-time. However it was great to be able to meet up with Isabella and Robin from Delaware North Companies UK, who are the catering providers at the Emirates Stadium, to talk pie and rate the Big Peppered Steak Pie produced by Holland’s Pies and sold at the stadium. Unlike League Two Morecambe FC, who we reviewed a few weeks ago, Arsenal’s caterers provide a different catering provision to standard match day supporters in the outlets and the hospitality suites. I therefore just sampled the match day half-time pie, provided in the many food outlets around the Emirates Stadium, which have been increased in number to cope with demand. Overall, I thought this was a very accurate portrayal of the quality of pie being provided by Holland’s Pies. There were plenty of big chunks of meat, which certainly didn’t feel like just a quarter filled with meat. While filled with large pieces of meat to appeal to the hand-eaten pie demand of football fans (which is a similar meat size policy to Piebury Corner and Morecambe FC football pies), I would have preferred the meat to have been in slightly greater quantity and more evenly spread across the pie. One of the major disappointments was that it took until the third bite into this pie to get to the meaty filling – with the first two bites just trying to get through the quite thick outer pastry layer. Upon getting to the meat though, it was indeed very tender and tasted good. In my opinion there was too much pepper in this pie despite being sold as a “peppered steak pie”. I was certainly appreciative of the drink provided during a few mouthfuls of very peppered content. The pastry was quite thick on the outer pastry but did hold together very well. This is of course essential for a top football pie but also important for any pies. This thicker pastry shell did however contribute to the first few mouthfuls containing no meat, which I’m always disappointed about on eating a meat pie. Fortunately the pastry was quite crisp on the top rim, and softer but not soggy on the sides and base. Overall I’m Gunner definitely recommend Arsenal fans consider a Holland’s Pie at half time. A little pricey but they weren’t lying when they call this a big pie! While not the highest rated pie sold in the Borough of Islington, if you are at the game you should certainly consider hitting the back of the net with a half-time pie! And they scored more than Arsenal that game! Thank you to Isabella and Robin for meeting with me at half-time to talk pie and Hap-pie Birthday to Barnaby, who organised the football tickets as part of his Big 3-0 celebrations!